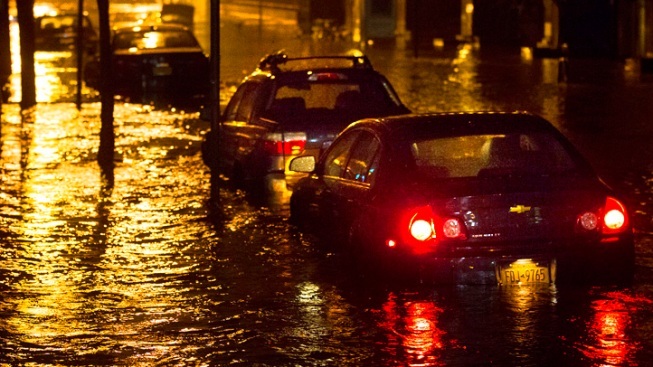 Vehicles are submerged during a storm surge near the Brooklyn Battery Tunnel, Monday, Oct. 29, 2012. The NYU Langone Medical Center was evacuated after its backup power generator failed in the midst of an outage caused by Sandy, officials say. The Manhattan hospital began transferring more than 200 patients to other facilities late Monday, including 20 babies from neonatal intensive care, some of them on respirators operating on battery power. Hospital officials said they had intermittent phone access and would notify families when the patients get to their destinations. Dozens of ambulances lined up to transfer the patients, who were taken out on stretchers. Flood lights were set up in the hospital's lobby, giving hospital workers enough light to facilitate the evacuation. In Manhattan, 193,000 customers are without power after an explosion at a Con Edison substation on 14th Street and Avenue C. Con Edison had also preemptively shut off power to some parts of lower Manhattan. Most residents below 39th Street had no electricity.